This weekend James and I took a trip out to Oxford to celebrate our friend Dori’s birthday. While we were there, she showed me her newest pride a joy, a “Jones” vintage sewing machine that she’d just bought from a charity shop for £4! It’s a real beauty, with a sturdy wooden case with folding arm and attached wooden base, nice solid steel construction, and a compartment full of random accessories. She was a bit disappointed to learn that it only does straight stitches (no zigzag), but I assured her that straight stitch machines usually do that one thing really, really well and that she still got a bargain. Included with the machine was a variety of machine feet which I was able to identify, but the true mystery was this tool, which to my eyes really looks like its purpose must be to inject thread straight into a vein!! 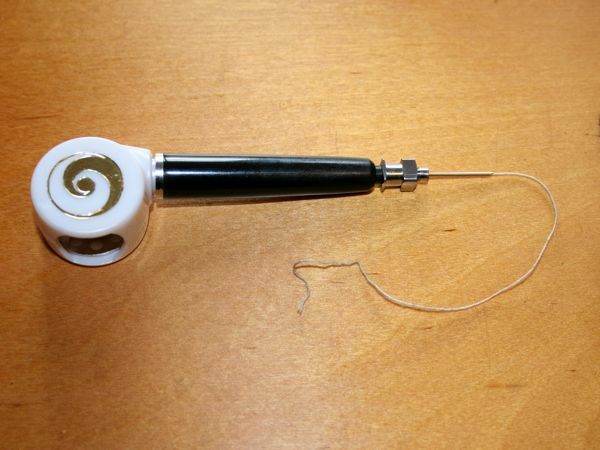 A bobbin fits into the round part, is somehow threaded through the pen-like body, and out through the hollow needle (zoom in on the second photo to see the needle). The tip doesn’t have a hole going through it like normal needles, but instead is hollowed out lengthwise with the thread emerging from the tip (it came with a spare tip and needle, too). I’ve never seen anything like this before, and I honestly can’t fathom how one would even thread it, let alone what it is used for. 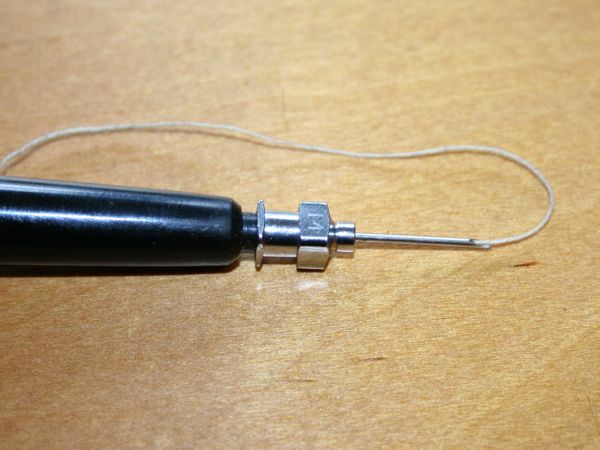 Does anyone know what this strange “thread injection” tool is? UPDATE: Boy, that didn’t take long, you’re awesome! 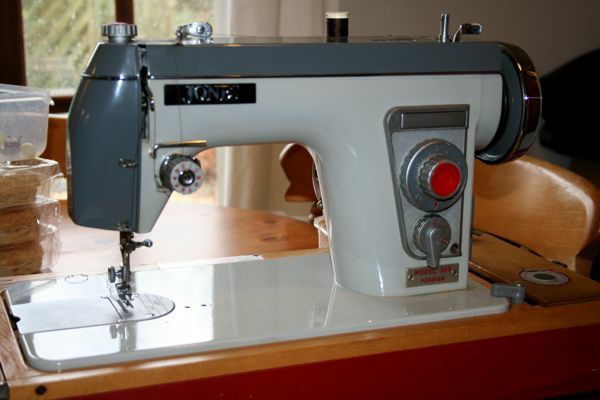 See Zoe’s comment below – it’s for making tailor’s tacks! And also thanks to her, you can now download pdf instructions for using the Tailor Marker! Separator image Posted in Inspiration and tagged with machine, vintage.